Although it is a world-renowned business and financial hub, with a workforce of almost 100,000 and many millions of square feet of commercial property space, there are plenty of desirable residential flats for sale in Canary Wharf. There is a wider range of options when looking for property than you might have thought – from luxurious Thames-view apartments to reasonably priced investment opportunities or first-time buyer homes on the Isle of Dogs. Once you start exploring flats for sale, Canary Wharf boasts an excellent selection, including both state-of-the-art new-builds and also attractive period conversions. You may have worked in the Canary Wharf district but not really looked at it as a potential place to purchase a property. However, it makes perfect sense for a number of reasons. For one, it is visually stunning, with its blend of iconic skyscrapers, historical warehouses and appealing river views. Leisure and recreation is also well catered for within the E14 postcode. From good-quality high-class curry dishes at Dockmasters House to long-established and legendary pasta dishes at Amerigo Vespucci, as well as live music and cigars on the terrace at Boisdales Scottish Bar, the choice is yours. A wander down Fisherman’s Walk on a Friday after work will reveal the full range of nightlife on offer. The area is also not short of everyday practicalities – the major chains such as Virgin Active have gyms and pools there, and large supermarkets such as Waitrose are also close by. There is more green space than in most business districts, and there are even some good schools if you are thinking of settling long-term. Transport links are also really excellent – using the reliable Jubilee Line, you can reach the West End in under 15 minutes. Alternatively, the DLR connects across the region with convenient stops at Heron Quays, West India Quay and Canary Wharf itself. You can even opt for a river taxi to Embankment or London Bridge – it’s perhaps not the quickest way to travel, but it is certainly very scenic! 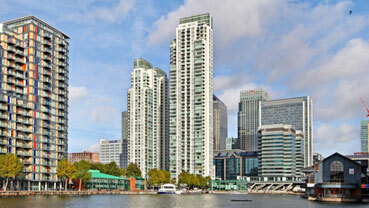 Why not have a browse through flats for sale in Canary Wharf online from a quality local agent such as Henry Wiltshire. You may be interested in flats in other areas such as Nine Elms. If so Henry Wiltshire can help with our property for sale and property to let in Nine Elms.